Welcome! I'm so honored to be sharing some projects with you from the new Best Days release from Simon Says Stamp! Check out the amazing line up for today's hop below! If you want to shop, check out the whole release HERE. So that my alcohol ink panel would really stand out, I used the new Blooming Wave Die and die cut many times out of paper that was adhesive backed. I simply adhered the pieces with my Tonic Craft Pick. For my sentiment, I reached for an older but favorite die, the Painted Hello Die. I die cut it several times out of white and once more out of Lavender Cardstock and glued them together. To finish, my tiny sentiment strip is from the older Happy & Smile stamp set. For my second card, I used the Oh Baby stamp set and coordinating Oh Baby Dies. I began with a piece of Fog Cardstock and using a cloud stencil, I sprayed the cloud background using Silver Glitter Dust. I stamped, Copic colored, and die cut my images. I added my sentiment in black ink and my images with foam adhesive. A simple twine bow finishes this off. When you get your new goodies, make sure to link up your Best Days projects to the Best Days Gallery. You will find LOTS of inspiration using the new products!! Now it wouldn't be a blog hop without a little something to give away! Simon Says Stamp is giving away a $25 coupon to every stop on the hop from comments on each blog. 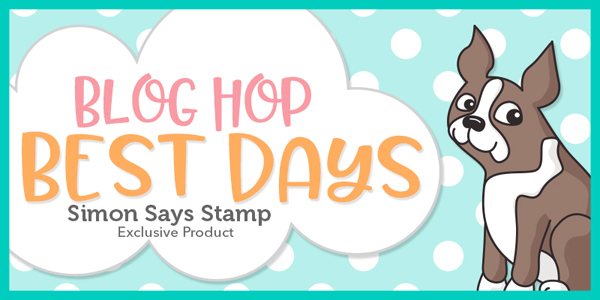 Winners will be chosen over the weekend and be posted on the Simon Says Stamp store blog on Wednesday, March 14. Cute cards! Cool new release! great alcohol ink background. The colors are so soft & pretty with the delicate die cuts. Love your use of the dies! Such sweet cards! Oh my!!! Love your beautiful and sweet cards!!! Thanks for sharing such a pretty card. This is one of my favorite SSS releases. Love the background coloring on your baby card. Pretty cards Amy, love the new baby stork such fun! What an adorable card!! Thanks for sharing! When I saw the die with the flowers, I imagined a design very similar to yours straight away, just in rainbow colours! :-) Great minds... ;-) both of your cards are lovely, thanks for sharing and inspiring! Wow. That took some time to add all those flowers. Very pretty. These are lovely! The white flowers are so pretty over your alcohol ink background and that little stork is just adorable. Love seeing all of these pretty cards. Nice Job. I too am liking the alcohol inks. Thanks for sharing. Beautiful backgrounds and beautiful cards!! You did a lot of adhering on the flower card! Well done! Very nice projects, love the alcohol background. I love how you patiently worked with the floral wave die. All are great! Love these Amy. The first one has such wonderful color. I have been using the alcohol inks a little and am enjoying how different each piece turns out. Thanks for inspiring. Beautiful cards! Great job! Very creative! What a labor of love in the floral wave card. Great ideas. Die cutting that floral wave so many times really made one beautiful card, Amy! Love your style! Love the soft look you got from your alcohol ink stripes. I tend to always go for super bold color combos, but now I think I need to try some more muted tones for even more versatility. All those white die cuts look so fresh and clean on the background! Love the embossed flowers!! Great baby card! Both of those cards are show stoppers! I just love the flower die on the thanks card. With that background! So so very pretty. And how can you resist such cute baby cards! Love it! Fabulous cards, love your backgrounds. I love the soft color palette you used for the baby card. The peach twine on the grey base is fantastic. Love your work with alcohol inks! Beautiful cards. I love your alcohol ink blended background. Gorgeous cards. I especially like that blooming waves die! Those blooming waves are gorgeous! I love the soft background colors! Really cute cards. Love the stork one. so fun and cute. thanks for sharing. Love your cards they are too adorable.. Your two cards are really awesome ! So gald the flower paper was self adhesive for you. Outstanding cards. It must have taken quite a bit of time to do the first one but it was worth it. Love them both. I love your cards, especially the one with the alcohol inks. Beautiful cards. I have to get some Yupo paper and try this alcohol ink technique out - such awesome results! TFS! Great cards. Love the one with all these flowers !! Love these cards- that flower wave die is sure versatile, isn't it? Great cards! Love that you combined your alcohol ink background with the dies! Your "hello" card seems like a lot of work but it sure is pretty. I love the stork one [more my style] and think the twine added just the right touch to it. the little white flowers on the alcohol inked background is so pretty! I'm just learning alcohol ink techniques. Thanks for yours. Pretty floral and cute baby card. 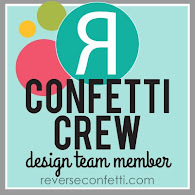 So clever using adhesive backed cardstock for the die cuts on the first one! That's a lot of bits to stick down. Beautiful card. My mom's favourite colour. Love the flower background so pretty! Love both your cards. Sweet, sweet baby card. Such a soft background using the alcohol inks. Very pretty. Oh, your alcohol ink and floral die card is so lovely! I love everything about it — the soft striped background, the waves of white flowers, and the sentiment. Your stork card is adorable as well. Thanks for sharing your creativity! I like how you used the Blooming Wave Die and the colors you chose as well. The Oh baby card is so sweet too. Such adorable cards! I love this release. I need to dig out my alcohol inks and revisit the techniques. These are beautiful cards; i am inspired! Oh my goodness, what darling cards! Thanks for sharing! I just got some alcohol inks and can't wait to try them thanks for sharing your cards the alcohol ink backgrounds turned out great. Love your use of inks and colors! Such a great job! Sweet cards! I am falling for all these baby stamps. Colors are incredible. Cute cards. A lot of gluing. You've showcased these products beautifully in your cards. The background on that first card is just beautiful! LOVE!!! And such a sweet baby card. Love the image and the softly inked clouds! Love that first card, it's so very pretty. And the second is absolutely delightful!! Fantastic floral background - beautiful card! Wow, love the floral background. Your stork card is adorable. I love the die cut florals on the alcohol back ground... really pretty! Ohhh, that baby card is soooo sweet! Love the clouds and the color scheme. Thanks for the inspiration. Cute cards with these fun new products! Awesome cards Amy. I would love to try the alcohol ink techniques, they really make for some beautiful backgrounds. Great cards! The new baby card is so sweet. Love the stork and the gender neutral colors. And that birthday card is gorgeous! The design and colors are phenomenal! Love the adorable baby card! Love the alcohol ink background and the pattern you created with the floral border die cut pieces! And the baby card is so sweet! Awesome cards! Love your waves of white flowers against that gorgeous background! The baby card is adorable! Hi beautiful cards, love the color on the first, the 2nd is so adorable, loved them. Thanks. Love elephants. Will def have to purchase. Love both cards—especially the baby card! I love those colors of alcohol ink and the cute white flowers! The baby card is so sweet. Too cute!! Loving the new release! Wow I loved both cards. The hello card is beautiful and I love the shades of inks. And the clouds on the second card are amazing. Just the right amount of shading. Thanks for sharing. Blessings. Great inspiration... I especially love the baby card. 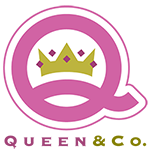 You demonstrated so many beautiful styles – I love them! Clever use of the Blooming Wave die. That’s thinking out of the box. Makes for a stunning card with thr intense color of the background. Very cute baby card, thanks for sharing! Both are very pretty. I can imagine the first card was a lot of work, sticking all the die cut flowers on. Both cards are fab but using the silver dust mist as a cloud stencil was pure genius!!! Very nice cards! Thanks for sharing! Your baby card is just so sweet! Love the soft colors and use of gray. Beautiful cards! The backgrounds are just stunning in both cards - the alcohol ink in the first card and the silver mist clouds in the second card. Love the blooming wave die over your lovely alcohol ink background. So delightfully spring! Adorable cards! I really love the stork baby card, thank you for sharing. Adorable cards, love the colouring at first one! A great job on these. 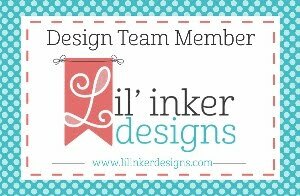 Your baby card is so softly colored & just beautiful! I also made some striped alcohol inked backgrounds and I agree they are just way too much fun!! Wow! That's a lot of paper piecing! Beautiful tho! I like both cards but the baby card really caught my eye. Wouldn't have thought to use grey cardstock but it makes the die cuts pop and looks classy. TFS I will be trying this soon. I need like 12 of those baby cards please. So cute!! And the ink alcohol background card is gorgeous. That baby card is adorable!!! I thought you used embossing paste when I first saw your card, wow! Fantastic cards! Oh my gosh! Your first card! All those tiny pieces! I just assumed I'd missed a stencil in the release that you'd used with embossing paste! You are a marvel! And your stork card is cute too! I love that stamp set! Oh man. You must have had abundant patience for that first card! How did you adhere all those tiny die pieces?? They both turned out great! Wonderful cards and your alcohol ink background is beautiful, will have to try that technique. I’m a huge fan of your gorgeous background you made on the first card ! I love the baby products. I like the subtleness of the clouds on the gray background. It turned out perfectly. Love your cards - they are adorable! Love the look of your striped alcohol ink background and the way you used the blooming wave die. Baby card is adorable! Sweet cards and new releases! thanks for sharing! Beautiful cards! Love that alcohol background! So pretty! 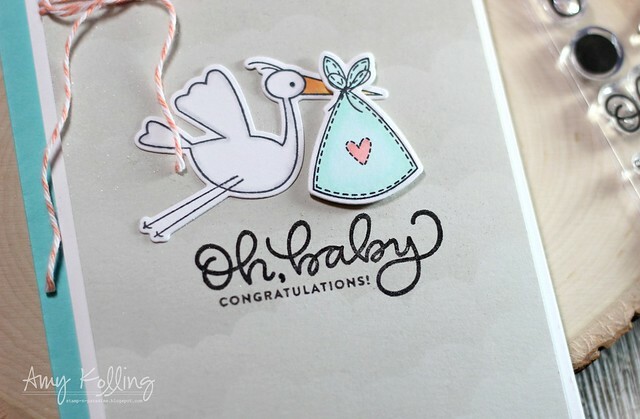 Love the subtle clouds on the stork card too! So pretty! Fantastic SSS release! Such a variety of products! Can't decide what to get first! UGH! Your stork card is absolutely adorable!!! Lovely cards, the pretty stripes and subtle clouds both make amazing backgrounds. Love the clouds on the grey cardstock....awesome cards. I love your cards, so cute! Holy cow these are fantastic!! Love the pretty flowers on the alcohol ink background! Great cards - thanks for sharing! Really like your purple hello card! Like the white flowers on that background! Your alcohol background is so pretty! Great cards! Pretty cards. The stork is so cute. I really like the floral card, and might just have to try it! Such a soft sweet card. I love how you used the flowers of the wreath as a background! Thanks for the inspiration! Both cards are awesome! Terrific cards! The baby card is super sweet and the floral card is amazing. Love the background and all the die pieces that you so perfectly arranged. the raised tiny flowers are beautiful!! What great ideas! I love the lavender colors against the white flowers. So pretty. Pretty cards! Love the Blooming Wave Die! Love the beautiful colors. The white flowers are fabulous against the stripes from the ink. these are precious! thank you for your work as a nurse as well! I worked 20 years as a pediatric oncology/HIV nurse. it is a very noble career! Gorgeous cards, I love all the soft colours you used. Thank you for these great examples with the stunning new SSS release. Both of your cards are delightful! Technique Tuesday / Easter Sale!